It's not too late to drive additional revenue with holiday SEO. And it's easier than you think. 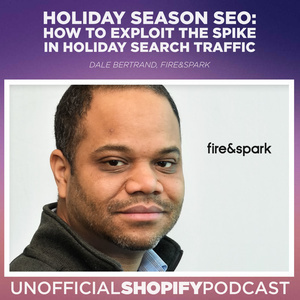 In this episode, we walk through each step of the holiday SEO planning process in detail. We'll learn how to engage in thoughtful keyword research, create optimized content for the season, and even the right way to link to your holiday content properly. Dale Bertrand runs Fire&Spark, an ecommerce marketing agency in Boston, MA. His clients include Citizen Watch, Ministry of Supply, Makerbot, Raymond Weil and Bulova. He has two decades of experience applying his graduate school work in artificial intelligence to digital marketing. Dale started his career building high-performance computing systems for the National Security Agency. Now, Dale is a specialist in search engine marketing, online advertising and analytics. In his spare time, Dale enjoys tennis, skiing and urban adventures with his two kids.